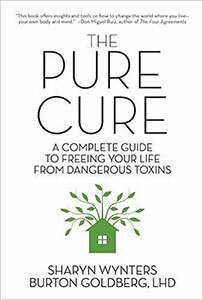 "The Pure Cure is a must read. It provides real solutions for living in our toxic world." At the age of 25, Sharyn Wynters received the most devastating news that anyone can receive. She had a disease. A serious, degenerative disease to which—according to the doctors—there was no cure. It was, in fact, cancer. At the time, knowledge of the "C" word was very much in early stages. Sharyn herself had never even heard of anyone having cancer before. Per the doctors, all she could look forward to was an unpleasant foray into the world of chemotherapy, which would only prolong the inevitable. Sharyn was unwilling to accept this fate. Instead, she embarked on a quest to recover through the powerful tool of nutrition. At the age of 26, she was successful. She had been connected with William Donald Kelly, a dentist in Texas who supposedly was “curing people through nutrition.” After much effort, and serious changes in diet and beyond, the disease was gone, and she was cured. At that point, she knew that despite the acting success, this was what she wanted to do. She then studied under William Donald Kelly, learning everything she could. From there, Sharyn studied even further, pursued the cause all the way to the level of a degree from the Clayton School of Natural Healing, and became a naturopathic doctor. She had overcome, and now had a passion for helping others. Today, she lectures nationwide on the many benefits of her healthy lifestyle program. She, in conjunction with Burton Goldberg, LHD, wrote the groundbreaking book “The Pure Cure,” which showcases in-depth the toxicity of the world we live in… and how to overcome and live a healthy life, regardless. Today, despite the return to acting, Sharyn considers herself a health advocate, and will gladly talk about the benefits of CBD oil, proper nutrition, living a toxic-free life, and much more. There are a few different ways you can get yourself a copy of The Pure Cure. Paperback and Kindle editions are available via Amazon, or, you can order a special copy autographed by Sharyn Wynters herself here through Paypal! "We must look to non-toxic and sustainable options if we are to move forward as a liberated human community. "The Pure Cure" is a masterful guide for those who are interested in the journey." ~ Gabriel Cousens M.D., M.D. (H), D.D., founder and director of the Tree of Life Rejuvenation Center; author of: "There Is A Cure For Diabetes"
"Changing the world can only be done one individual at a time. This book offers insights and tools on how to change the world where you live – your own body and mind." ~ Don Miguel Ruiz, author of "The Four Agreements," "The Fifth Agreement: A Practical Guide to Self Mastery," and "The Mastery of Love"
"Finally, two authors have put together a book that deals with the overwhelming toxic environment we live in. This outstanding book discusses everything from wireless toxins to toxic metals, to chemicals at home and in the workplace, to a whole host of everyday contaminants, that are literally destroying human civilization. THE PURE CURE is a must read. It provides real solutions for living in our toxic world." ~ Stephen T. Sinatra MD, FACC, CNS, co-author of "Earthling" and "The Healing Kitchen"
"This book is a must read for all to live a healthier, happier life in a toxic world. I comment the authors for having the foresight and the insight to synthesize the information. What’s in this book could save you and/or your family's life." ~ Sabina DeVita, EdD, DNM Director, International Institute of Energy Studies and author of "You Were Born to Dance with Ease!" "'The Pure Cure' is an insightful and powerful tool for those searching for meaningful health and healing. The authors expose the not-so-obvious and expound on the essentials in a way that empowers each reader to become a more responsive and responsible person. "In our stressful, busy world, most of us employ health-building methods in a cursory way, often neglecting the less obvious culprits that prevail. Most of is take our work and residential environments for granted. By lack of thought, we use cleaning products, building materials, and even lighting methods that drain our health. We adorn our bodies with chemicals and chemically-treated fabrics that perpetuate disease. We eat chemically-laden food, drink chemically-laden water and breathe polluted air. And just when we thing we have it all figured out, we remember our cell phone with it’s invisible wireless connectivity that links to computers, electronic books, iPods, and the big scary tower down the street. The authors leave no stone unturned. What I love most about this contribution is the nuance and detail that are central in health-building and conscious avoidance. "I See Your Face Before Me"